Home » Historical » Edwardian » Sartorial Death Metal? Heavy metal is generally thought to be anything but dressy. 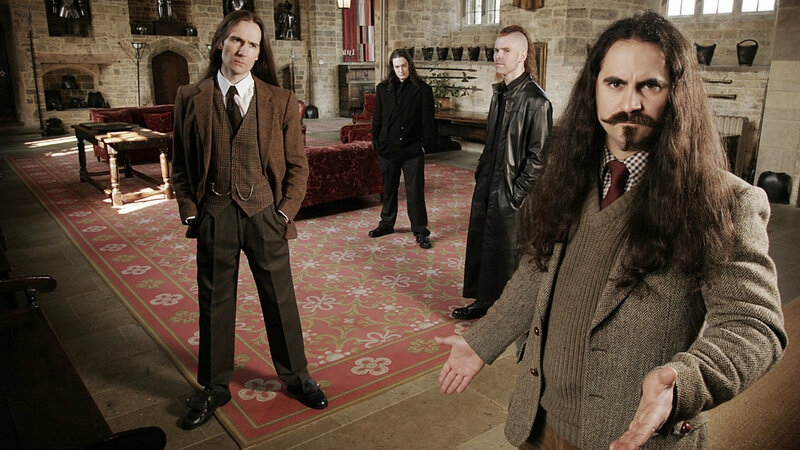 But a few bands towards the extreme end of the metal spectrum have defied the stereotype of denim and corpse paint by opting for more tailored attire. The Italian symphonic metal band is taking the world by storm in dusty tailcoats and wing collars and starched wing collars. “It’s a little bit of theatre, it’s about energy, it’s about the personality of everyone coming out into one thing, I couldn’t describe the theatrical aspect,” former bandmember Tommaso Riccardi told Prog-Sphere. “Obviously, there are elements we are introducing that are concrete- we don’t do this here (in North America) but all the shows we do in Europe we have a piano, an actual piano on stage. The way we are, the way we dress up, the things we have, it all factors in. We try to do the opera thing- we try to get that across on stage, in the show. There’s no moments in the show where things are stopped.” Buy their album King here. Their music videos have a distinctly Rococo feel set in period interiors with pianos and wailing opera singers.